Scheduled for May 2018 at Windsor Castle, the wedding of HRH Prince Harry and erstwhile TV star Meghan Markle is the international royal event of the decade. Scheduled for May 2018 at Windsor Castle, the wedding of HRH Prince Harry and erstwhile TV star Meghan Markle is the international royal event of the decade. This opulently produced souvenir captures all the grandeur and magnificence of a day that will be celebrated by billions of people across the globe. The intensely romantic relationship that preceded the wedding is traced in fascinating detail and illustrated by many lavish photographs. Then, the spectacle of the wedding itself is presented in full. Beautiful images of the venue will set the scene, followed by in-depth portrayals of the wedding processions, and the arrival of Prince Harry and his supporter. The appearance of the star-studded cast of international celebrities, heads of state, members of the royal houses of Europe and, of course, the British royal family, who will all attend on the day. Next, the deployment of the bridesmaids and pageboys will be recorded in charming detail, followed by the entrance of the beautiful bride. All the key moments of the ceremony itself will be captured in breathtaking, full-colour detail. A great day is in prospect and the world can hardly wait. 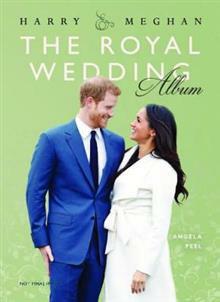 Angela Peel is a journalist and author who has produced a series of books on royal subjects. She has written for a variety of magazines including Hello!, Glamour, Marie Claire and Elle and is a regular contributor to The Times and Vanity Fair.